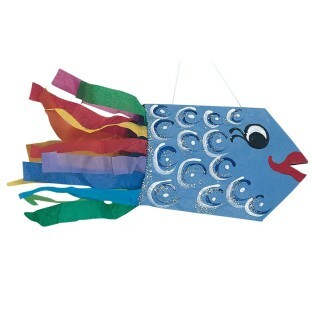 Fun fish windsocks or wall hangings. Easy and impressive - Get creative! Science, geography or anytime fun! Catch The Fish Tail. This brilliantly colored fish makes an excellent windsock or wall hanging. 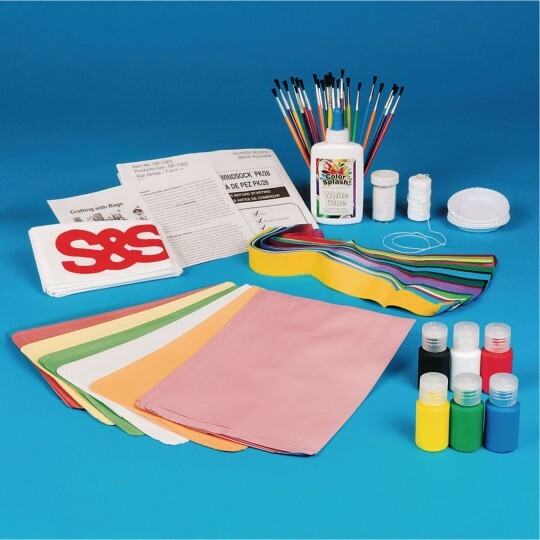 This fun pack includes kite cord, non-toxic glue and paint, glitter, bags, tissue paper, brushes and instructions. Pack of 28. This craft was used for VBS. It looked great and helped illustrate the loaves fishes Bible story. It was nice that everything needed was included. It was a little time-consuming and the preschoolers needed lots of help. This product left a lot of room for individual creativity. My senior citizens enjoyed making the fish and then we hung them from the ceiling in the dining room for decoration. I used this craft to accompany a bible story of Jesus multiplying the Loaves and Fish. The kids loved it!!! We used this product at our church's VBS. Kids were ages 4 yrs through 5th grade. It took the kids about 20-25 minutes to do the project which worked well for us.Pros: Allowed the kids to have input into how they decorated the fish. Good for the broad age range we needed.Cons: Instructions and design only allowed for painting on one side of the fish unless you waited for it to dry completely which we didn't have time for. We did use 2 liter water bottles though to put the fish on so the kids could paint both sides of the fish in 20 minutes. That worked ok.